Sunday is the reef day and we started out by putting some pilchards in the livewell. Loaded with good looking bait we headed to some rocky grounds. Went to a couple spots and sounder was not showing much. Green water and no current was not helping to dial in a spot. We finally just set up on a nice ledge with a few marks and started chuming. Picked up a few short groupers and one keeper. 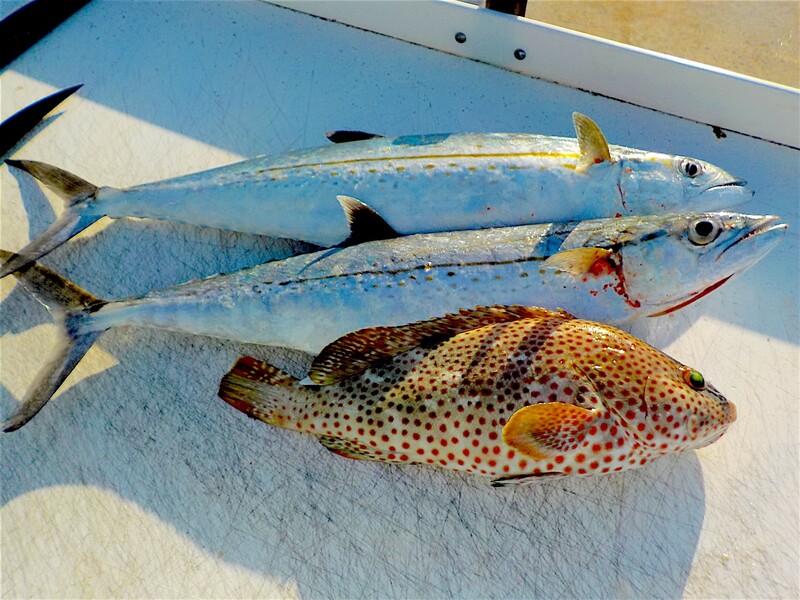 We never had school of yellowtails show up but we picked at what we could including a couple of nice Ceros. With the bottom not cooperating we went out to the color change and tried drifting in the clean water. Freelined live pilchards and dropped one to the bottom. Drifted in two depths but didn’t get a strike. Plan C, we slow trolled the reef for kin gs, cero or grouper while watching for new marks. Came across a good looking spot and dropped anchor again. This time we marked a lot of fish, so out goes the chum. Chubs and spade fish no yellowtail. Worked the area for a while and got small YT, small grouper and grunts. Ran out of time for plan D, so back to the dock.